ChatBOT is not a new buzzword. It is in existence since last many years but today as the businesses are more customer centric and distributed, rapid assistance and information flow play an important role. Chat BOTs have the potential to leverage Customer Care, after sales support and information distribution. In good old days Chat BOTs were able to mimic user conversation by matching user prompt and provide scripted response. But now a days traditional BOTs are replaced with much smarter piece of code and are equipped with more intelligence that can recognize and respond to human language. Thanks to NLP (a building block of AI) which makes it powerful enough to understand most of the day to day human interactions. As Chatbot is hot cake these days and most companies are experimenting with it. Moreover, most of the ChatBots which are popping-up these days are not truly AI based but in fact are experiencing piecemeal flavor of AI (i.e. NLP, Machine Learning, cognitive, deep Learning). Journey of Chatbots went through various stages out of which some are truly achieved and some are still futuristic. Majorly ChatBots are categorized into two segments i.e. Open Domain (infinite scope) and Closed Domain (handling specific set of requirement). It is absolutely necessary to finalize the real need and then strategize the approach and architecture. Scope of Open Domain Chatbot is very vast and is expected to cater infinite number of areas in which users may want to interact but it is not feasible to respond to all chats with same quality as that of a human. So, an Open Domain type of Chatbot needs to be equipped with assured amount of global knowledge and then would try to logically redirect the user to appropriate place. To say it better, these types of Chatbots are Jack of all but master of none. On the other hand closed domain Chatbots are something which stick to particular set of requirements and meet specific goals such as HR assistance for employees, Technical Customer assistance (Application Support) etc. Closed Domain family BOTs are categorized in two segment i.e. Rule based and Intelligent BOTs. Script based Q&A comes under Rule based category where short questions can be answered through scripted response. Here user can ask limited set of questions which are already present in the CMDB/KEDB and FAQs dataset another example of Rule based BOT is Assistant BOT which can raise Service Request ticket on user’s behalf after getting problem statement and provide you the incident number. Intelligent BOTs can understand input and context provided by the user hence it respond to unforeseen scenarios which is not pre-existed in the database and handle long conversations. BOTs coming in this family are extensively using NLP for understanding long conversations and machine learning for model generation and appropriate resolution. Auto Remediation SNOW Tickets BOT is a good example, where it understands problem statement mentioned by user and resolves the incident through RCA mechanism. In case of highly complex incident where BOT is not able to resolve then it will facilitates multiple options (through semantic parsing mechanism) with best possible solutions from KEDB. Smartness of the Chabot is dependent on the appropriate usage of AI building blocks. How smart technologist has incorporated these features can decide the usefulness of the chatbot. 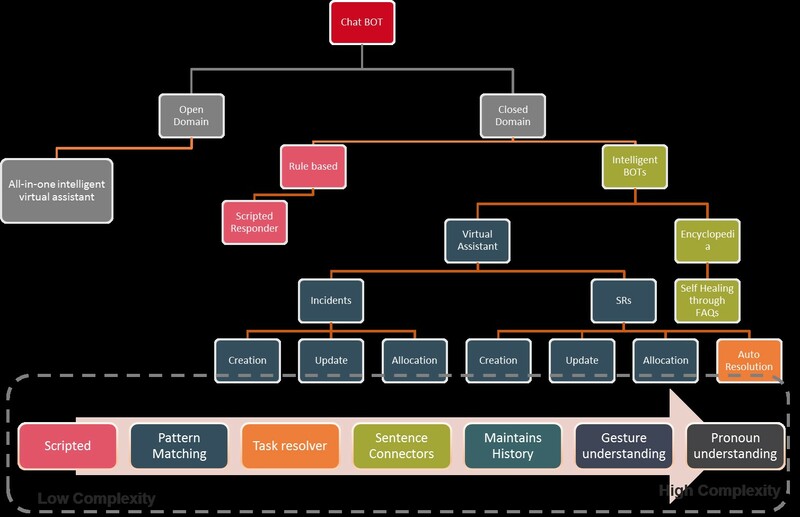 Concepts of AI in itself is not new and companies like Google, FB are using these features since long time but taking advantage of such features within conversational interfaces(i.e. Chatbot) is something which is getting glorified since early 2016 onwards. There are some features which enhances the user experience while chatting, how about Chatbot co-relates with historical chats and gesture understanding. This feature would certainly enrich user experience and fortunately these features (up to some extend) had already been applied in conversational BOTS. Additionally there are some features which looks fascinating and promising but unfortunately futuristic, one of them is collaborator feature, BOTs coming in this category can relate to the real problem and apply general ability to help attitude instead of vanilla script based request/response mechanism. One more very advanced feature which is counselling where BOT could provide companionship to the user. Definitely these are not unexplored territories but still lot of hard work is required to automatize such features.